Port Jebel Ali is the biggest man-made harbour in the world, Image courtesy of Imre Solt. The port is spread across 134km² of land and is equipped with 67 berths, Image courtesy of Imre Solt. The terminal currently features 29 STS quay cranes and 60 RMG cranes, Image courtesy of Bjoertvedt. CyberLogitec supplied its OPUS Terminal Operating System (TOS) for the port. DP World Chairman HE Sultan Ahmed Bin Sulayem (left) inspecting the construction underway at Jebel Ali's Container Terminals 2, accompanied by Mohammed Ali Ahmed, CEO, DP World UAE Region, Image courtesy of DP World. Jebel Ali 1 Terminal at night, Image courtesy DP World. Expansion work on Terminal 2 (T2) of Jebel Ali Port, located at Jebel Ali free zone, approximately 35km south-west of Dubai, was completed in June 2013. A new terminal, Terminal 3 (T3), was inaugurated in 2014. The two expansion works were part of the larger expansion programme undertaken by the port operator DP World (DPW), covering 15 different phases, which will be realised by 2030 and make it the largest port in the world with a handling capacity of 55 million TEU. Jebel Ali Port had an initial handling capacity of approximately 14 million TEU of cargo. The expansion of the existing T2 increased the capacity by an additional one million TEU, while T3 has increased the port’s capacity further to 19 million TEU. The Terminal 2 expansion cost $1.5bn, while the construction of T3 cost $850m. The two expansion projects created more than 1,000 jobs. "Construction of the port began in 1976 and was officially inaugurated by Queen Elizabeth II in 1979." 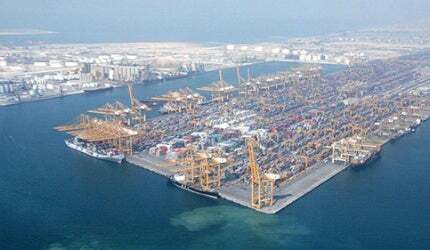 Jebel Ali Port is spread across 134km² of land and is equipped with 67 berths. It caters to a market population of 1.5 billion people. The port dealt with more than 500,000 vessels in 2012. Construction of the port began in 1976 and was officially inaugurated by Queen Elizabeth II in 1979. The port was primarily constructed to supplement Port Rashid, which became inadequate for the growing number of cargo ships. Construction on the first phase of T2 at Jebel Ali Port expansion began in 2005 and was completed in August 2007. The second phase of the T2 expansion was started in 2008. The expansion necessitated the dredging of 25 million cubic metres of soft rock from the seabed to create certain offshore parts of the terminal and the construction of an island on other side of the new quay wall. The construction work also included the creation of 6.6km of revetments and a 2km rubble mound breakwater. The storage yard, including other ancillary buildings and equipment at T2 currently covers an area of 182ha. The terminal features 29 ship-to-shore (STS) quay cranes and 60 Rail Mounted Gantry (RMG) cranes. Each giant crane at the port is capable of lifting 80t of cargo. The T2 expansion extended the terminal quay from 2,600m to 3,000m. The foundation was constructed using 2,752 concrete blocks weighing 65t each. The new T3 has a quay length of 1,860m, a depth of 17m and a storage yard of 70ha. It was built in place of an existing general cargo berth. "The expansion necessitated the dredging of 25 million cubic metres of soft rock from the seabed." The terminal is provided with 19 STS quay cranes and 50 RMG cranes. It also features the OPUS Terminal Operating System supplied by CyberLogitec. The T2 is capable of facilitating six 15,000 TEU vessels at a time, while the T3 is capable of facilitating ten 18,000 TEU vessels. The existing port was constructed by Halcrow. The company further developed the masterplan for long-term expansion of the port and carried out the construction works for the first phase of the T2. The T3 was developed by the joint venture (JV) of TOA and Soletanche Bachy. Trans Gulf Port Cranes (TGPC) supplied ten STS quay cranes and 25 RMG cranes, while nine STS quay cranes and 25 RMG cranes were supplied by Shanghai Zhenua Heavy Industries (ZPMC), all of which are incorporated in the new T3. Khalifa Port is located about five kilometres offshore from Taweelah, in Abu Dhabi, on what is a reclaimed artificial island.